Born in South Africa, Anderson’s family moved to the US when he was a teenager. Having played rugby while growing up, he quickly showed that he could kick an American football and received a scholarship to Syracuse University. In college, he played two seasons of soccer and, in football he set school season records for field goals (18) and field goal percentage (94.7) in 1981. Anderson was chosen in the seventh round of the 1982 NFL draft by the Buffalo Bills, who cut him prior to the season. Picked up by the Steelers, he was successful on 10 of 12 field goal attempts as well as all 22 tries for extra points during the strike-shortened ’82 season. Wearing his characteristic single-bar facemask, Anderson went on to kick for 13 seasons with the Steelers. He topped the AFC in scoring in 1983, the first of three consecutive seasons in which he did so, and he led the AFC in field goals in ’84 (24) and the entire NFL with 33 in 1985 (his high with Pittsburgh). Anderson received at least some All-NFL recognition in 1985 and ’93 and was named to the Pro Bowl three times as a Steeler. He left Pittsburgh following the 1994 season as the franchise leader in field goals (309) and scoring (1343 points) and spent two years with Philadelphia and one with the 49ers in ’97. Anderson signed a three-year contract to join the Vikings in 1998. Vikings went 15-1 to finish first in the NFC Central with the league’s best record while leading the NFL in passing yards (4328), touchdowns (64), and scoring (556 points). Won NFC Divisional playoff over Arizona Cardinals (41-21). Lost NFC Championship to Atlanta Falcons (30-27). His excellent 1998 season having come to a disappointing end in the postseason, Anderson followed up with a career-low 63.3 field goal percentage in 1999 but bounced back to connect on 95.7 percent in 2000 (22 of 23) and lasted with the Vikings through 2002. He finished his career with two seasons in Tennessee in 2003 and ’04, by which time he was 45 years old. 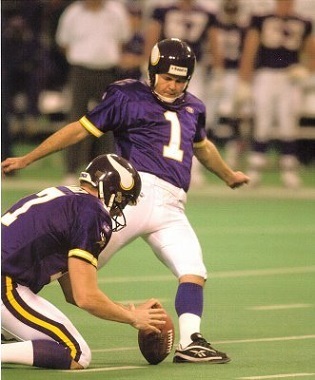 Overall, over the course of 23 seasons, Anderson kicked 538 field goals in 672 attempts, both career NFL records at the time, for an 80.1 percentage and 2434 points, also the league career high (his contemporary, Morten Andersen, ultimately surpassed him in all three NFL-record categories). He also kicked 820 extra points, which were second-highest in league history at the time. Anderson added another 32 field goals, in 40 attempts (80.0 %) and 57 extra points in 22 postseason games, with a high of four field goals against the Oilers in 1989.